Bacon! 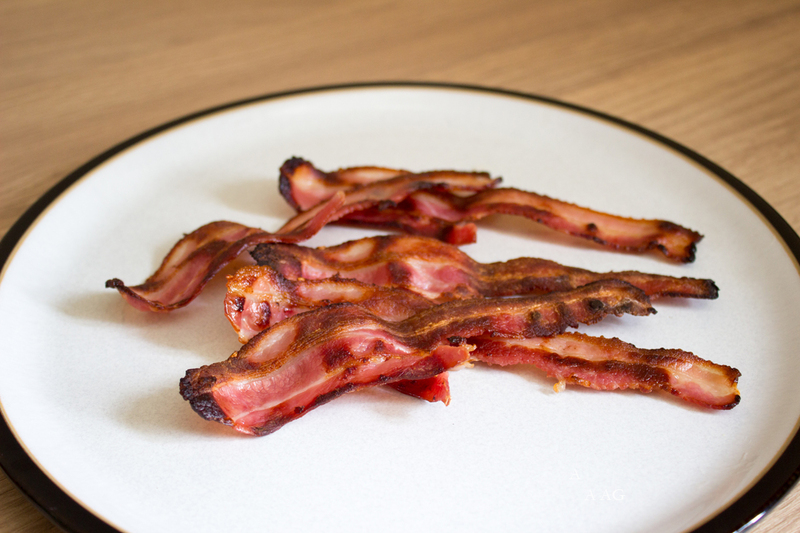 We LOVE bacon in this house, as long as it's smoked and crispy any bacon is good. For the life of me I can't understand anyone not liking bacon done all nice and crispy. 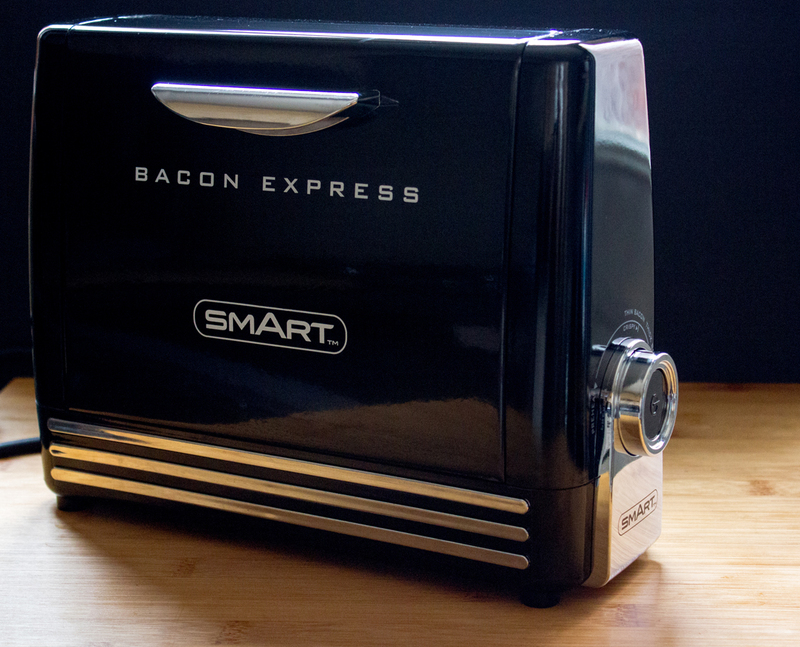 Anyway, let me introduce you to the Smart Bacon Express - a little machine that cooks bacon to perfection. Not only that but it's a healthier way to cook bacon too. Before I go on though, let me show you the lovely crispy bacon this produced - Check this out! Nice ah? Of course if you really don't like your bacon done so much you simply turn the dial down. 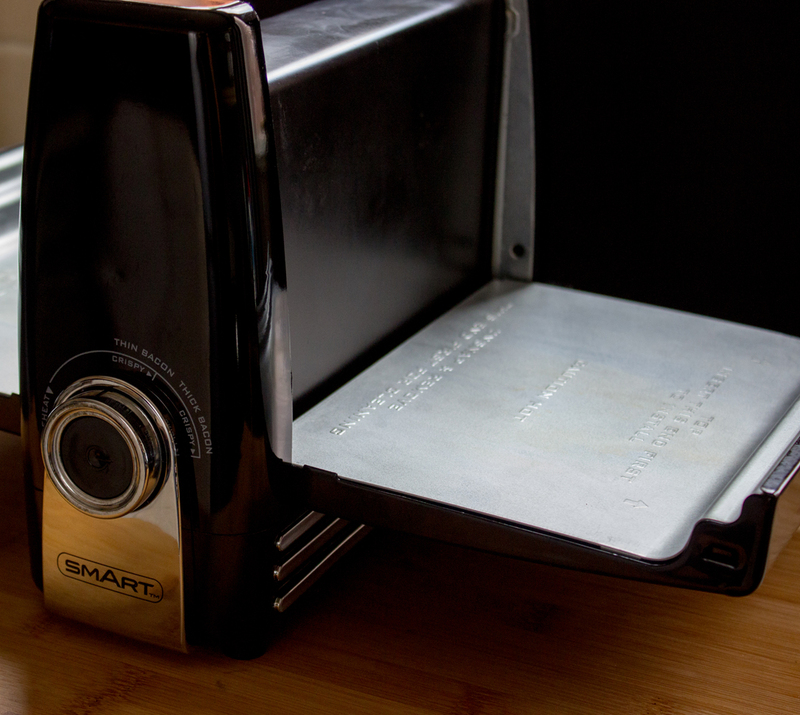 Yes it might look a bit like a toaster, but this is a BACON toaster and I say bacon is far more interesting than toast! Plug it in and turn the dial to 'Preheat' (takes a couple of minutes) then when it's ready a couple of nice loud beeps can be heard. Open both sides and you drape each rasher of bacon over the top part and close the sides. Select the type of bacon you are cooking by turning the dial; thin or thick cut. Now turn the dial to anywhere between the maximum arrow to select how well done you like your bacon. I found setting it in line with the 'C' in the word Crispy and found it to be perfect for us. Of course when you use it you'll find out which setting suits you for the type of bacon you are cooking and then as long as you remember where you put the dial it will cook it the same every time. Just don't let the rashers of bacon overlap because if you do they won't cook evenly. There's no mess as the fat drips into a removable drip tray which slides in underneath the Smart Bacon Express. Once done a loud beeping sound can be heard and the cool touch handles on the side allow you to open the sides again (just be careful of any steam) to remove the nicely cooked bacon. Cleaning is easy as the drip tray and the cooking plates lift out as does the centre part that you lay the bacon over to cook. Just pop them into some nice hot sudsy water to clean then rinse and dry before putting it back together. 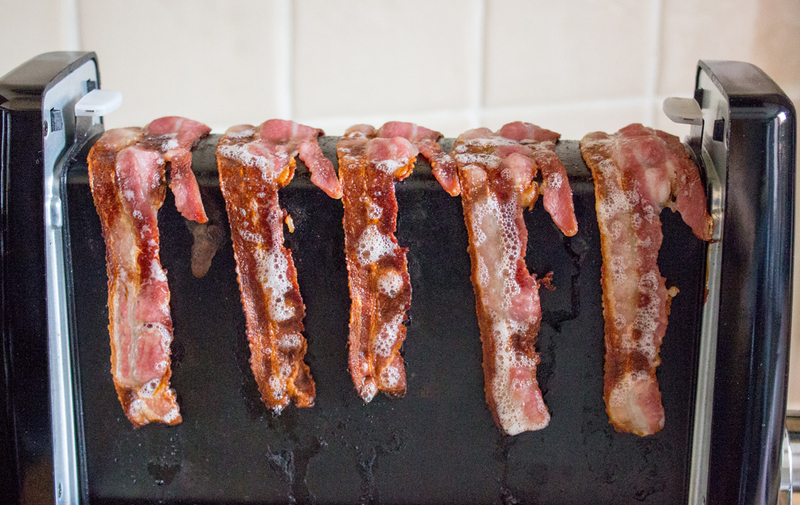 A healthier way to cook bacon as the bacon lays vertically and the fat drips away. 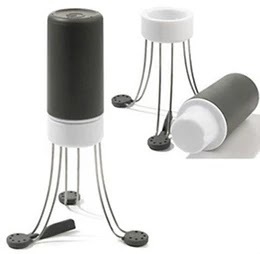 It cooks quickly and produces perfectly crispy bacon or however you like it, every time. Easy to clean in hot sudsy water. No stove top to clean as you would if you fried bacon in a pan. Cooks up to 6 rashers but if you need to cook more bacon it's done in no time as it's already hot. Suitable for Thick and Thin cut bacon. Series of nice loud beeps when ready. I found I could only fit 3 rashers of back bacon without them overlapping although you can cook more bacon straight away; see above Pro's. The Smart Bacon Express is New and Exclusive to Harts of Stur and is available from next week (mid August) but of course you can order one right now. For more information and to order the Smart Bacon Express pop over to Harts of Stur. 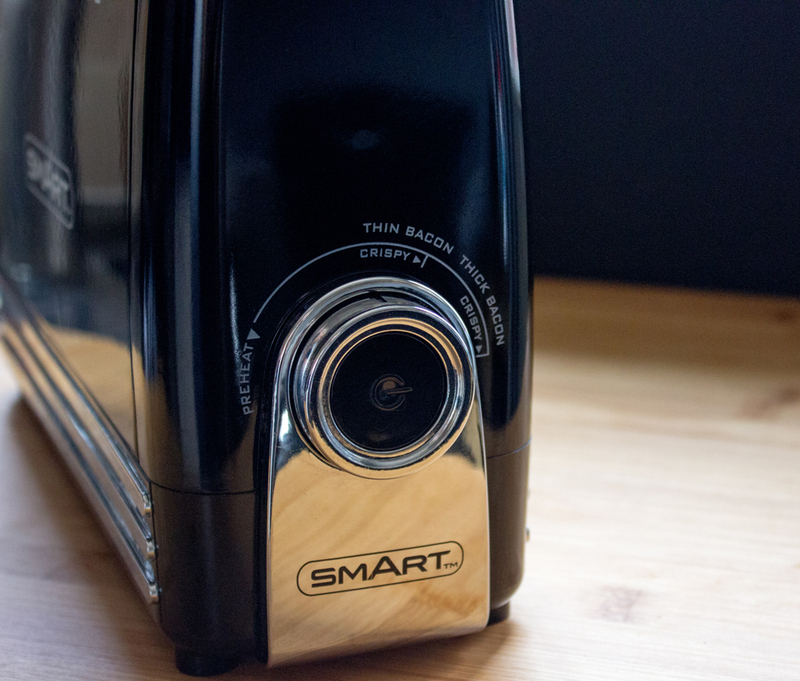 Disclosure: I was sent the Smart Bacon Express for the purpose of this review. All thoughts and opinions are my own. I was not required to write anything positive. 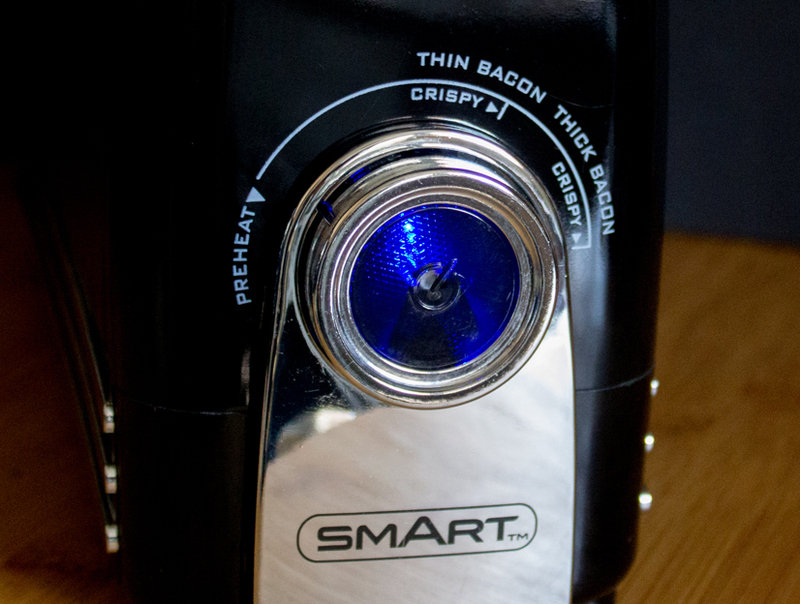 Oh my that is the ultimate gadget for a bacon lover! It reminds me of my grans old 1940s toaster which opened up like that too. Your bacon looks perfect!